As people are making their 2015 NCAA tournament picks, three of the most common Final Four choices are No. 1 seed Kentucky in the Midwest (34-0, ranked 1st), No. 1 seed Villanova in the East (32-2, ranked 2nd) and No. 2 seed Arizona in the West (31-3, ranked 4th in one poll, 5th in the other). What do all three of these clubs have in common? 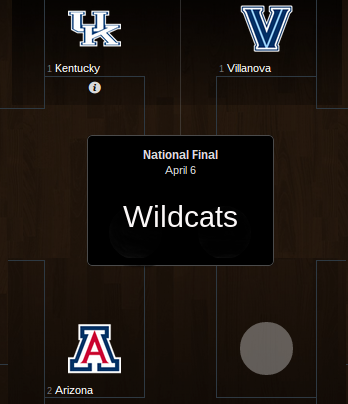 According to VegasInsider.com, the Kentucky Wildcats are 1:1 (50%) to win the whole thing. The Villanova Wildcats are 8:1 (11.1%), while the Arizona Wildcats are 12:1 (7.7%). Add those up and the chances of a Wildcats champion are roughly 69%.